Make an entrance on your special day, by arriving in style. 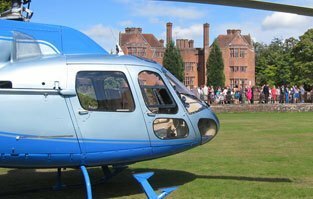 You will certainly catch the eye of the wedding party as you make a grand entrance in a helicopter – Prices from £2000.00 + VAT. Add a magical element to your day, using a glamorous and exciting alternative to the more traditional limousine. Be whisked away over the traffic below to get to the altar on time and in style. You will make an unforgettable entrance or exit as the beaming, newly married couple, from your chosen venue. Your helicopter flight complements your schedule perfectly and helps your day run smoothly. Without worrying about delays on the roads this is one less thing to worry about on the day. Start your day full of romance and memories that you will want to treasure forever with an experience to make the day extra special. Luxury items such as champagne and flowers will be placed in the helicopter ready for your arrival to add even more to your experience. If you want to use the helicopter after the wedding is over, as a newly married couple, you may even choose to have a special wedding hamper onboard to share together, as you have a few minutes alone to reflect on your special day. Add special aerial shots to your official album, which you may wish to take yourselves or have your professional photographer take them, to give you even more memories of your wedding. Your spectacular arrival and departure will be captured forever as we will liaise with your photographer so they have plenty of time to record the helicopter at your wedding. A flight makes the perfect wedding gift to a newly married couple; their first flight together as man and wife, arriving at their reception at a hotel or going onto their honeymoon. The Bridal Party can share a private toast before joining the other guests. Include a sky tour of the local area, flying over the landmarks and points of interest before landing at the wedding venue. Fly wherever you want to go, subject to prior notice and the filing of necessary flight plans, maybe flying over where you first met or where the proposal took place. Enjoy peace of mind, safe in the knowledge that this part of your wedding will all run smoothly. All the flight plans and permissions, provision of the appropriate crew and all other details are taken care of by a dedicated events manager. Your special day means you are likely to have specific requirements in mind already so we will be very happy to work with you, to give you the personal package and service that you want for your wedding. The focus is on providing you with a truly personal wedding helicopter trip that covers all eventualities. To book your ultimate wedding gift and enhance your day call our team now on 01256 635000.